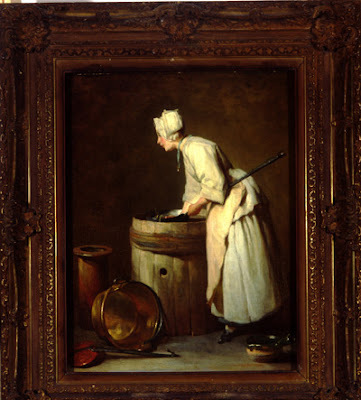 In large households, scullery maids were hired to assist the cook. Scullery maids, who were usually very young girls, were also the lowest-ranked of the female servants. As such they were the first to wake up in the morning and the last to go to bed, worked very hard and were looked down upon even by the other servants. They didn’t even eat at the communal servants’ dining hall table, because they had to stay in the kitchen to keep an eye on the food that was still cooking. But what were her duties? The position of scullery-maid is not, of course, one of high rank, nor is the payment for her services large. But if she be fortunate enough to have over her a good kitchen-maid and clever cook, she may very soon learn to perform various little duties connected with cooking operations, which may be of considerable service in fitting her for a more responsible place. Now, it will be doubtless thought by the majority of our readers, that the fascinations connected with the position of the scullery-maid, are not so great as to induce many people to leave a comfortable home in order to work in a scullery. A Life of Service, a BBC Radio Scotland programme, has interviewed a woman who worked as a scullery maid in the 1930s. You can hear her describing her job, which boarded on slavery, here.